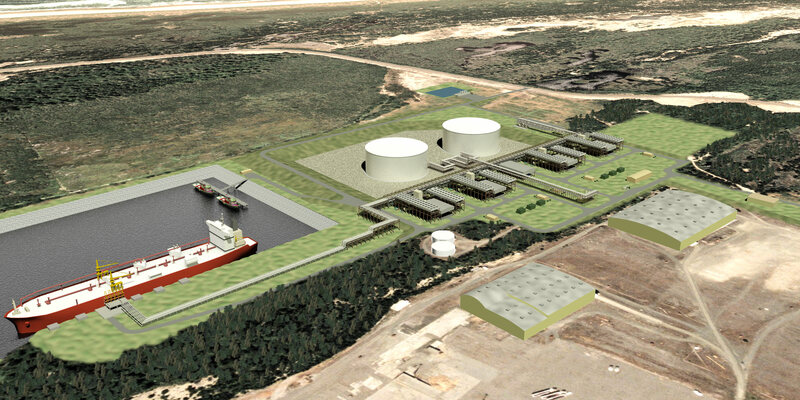 Jordan Cove Liquified Natural Gas (LNG) Terminal | David Evans and Associates, Inc.
DEA is providing multidisciplinary services for this major new marine terminal and LNG plant on the Oregon coast. The project is located within the Coos Bay harbor on the North Spit of lower Coos Bay, approximately 7 nautical miles from the entrance of the federally controlled and maintained navigation channel. Tasks include obtaining environmental clearances for dredging a new slip and turning basin, channel improvements, an LNG plant, and the associated 350 MW gas-fired power plant in Coos Bay. Additionally, DEA conducted the permit agency coordination and negotiated permit conditions for this project, and assisted the Port of Coos Bay and Jordan Cove LNG in preparing responses to interested parties, which included the U.S. Army Corps of Engineers; NOAA Fisheries; U.S. Fish and Wildlife Service; Environmental Protection Agency; Oregon Departments of Fish and Wildlife, State Lands, Environmental Quality, and Land Conservation and Development; Native American tribes; and the public.